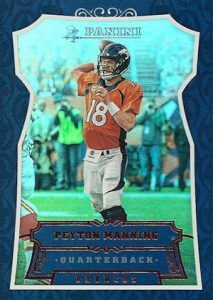 2016 Panini Football takes a retail-only approach that features multiple inserts and a mix of die-cut designs. 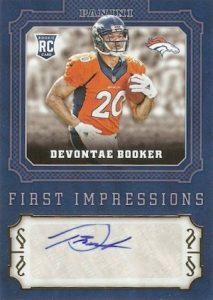 Blasters contain one autograph or relic per box. 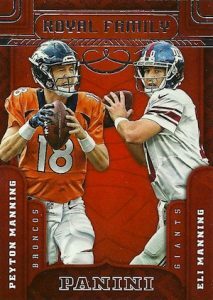 Seemingly merging the looks of several products, the 2016 Panini Football base set showcases a large frame and deep colors. Holofoil parallels put a noticeable shine on the set and include Bravery (Blaster), Chivalry (Fat Pack) and Sacrifice Die-Cut (#/199 - Basic Retail) editions. 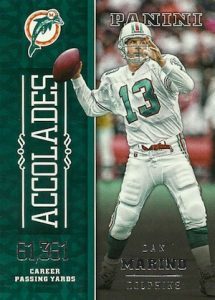 Many rookies are featured in the first card images with their NFL jerseys. 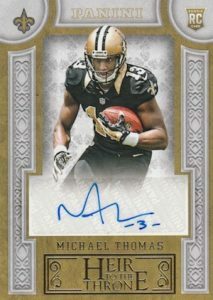 Featuring several hit choices, 2016 Panini Football includes Base Autographs, Calligraphy, First Impressions and Heir to the Throne on the signed front along with Catapults, Gridiron Warriors and Squires Jerseys for memorabilia collectors. A case hit, Knights of the Round inserts display a die-cut design and large Panini logo. 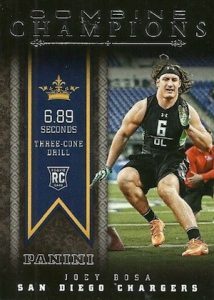 Other inserts include Combine Champions that feature top rookies at the pre-draft event. 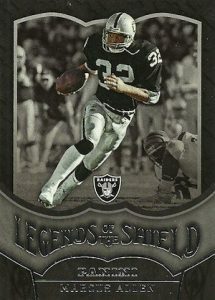 Several inserts celebrate former greats, including Accolades, Decorated, and Legends of the Shield. 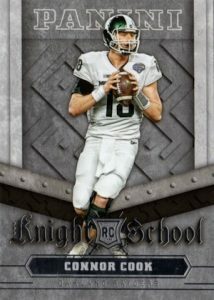 Knight School utilizes college images for top draftees while Royal Family pairs siblings that both played in the league. 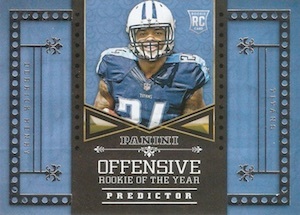 Likely a familiar concept, Predictor cards yield an exclusive insert set if the player named on the card wins the award specified. Among these are top contenders for MVP and Rookie of the Year. 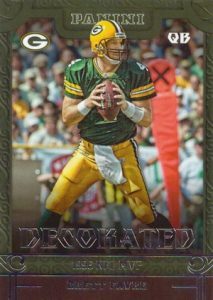 There are also Wild Card versions with no player noted. Product Configuration: Blaster, Retail Box and Fat Pack formats. JACOBY BRISSETT 2016 PANINI FIRST IMPRESSIONS ROOKIE AUTOGRAPH AUTO -PATRIOTS!! PARALLEL CARDS: Chainmail Armor, Knight's Templar, Shining Armor, Bravery #/199 (Blaster), Chivalry #/199 (Fat Pack), Sacrifice Die-Cuts #/199 (Basic retail packs), Blue Knight #/99, Red Knight #/49, Gold Knight #/10, Black Knight 1/1. PARALLEL CARDS: Red #/25, Gold #/10, Black 1/1. *Cards #1 and #11 not included in parallel. *Card #13 not included in parallel. to tell apart.Make sure you check them in a well lit area. Not a bad set but trying to read the numbers on the card backs may cause you to go blind. Who ever thought this way up to number the cards needs help. Trying to tell 5 from 2 etc. is a task,this needs to be improved. 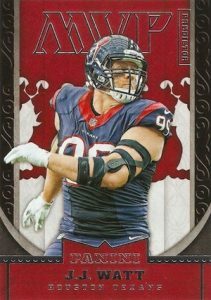 I assume that this will be the replacement for topps ??? 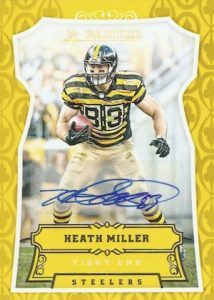 I can’t stand how Panini advertises “One auto or memorabilia per box.” (Or in all their hobby stuff “4 autos or memorabilia cards per box). What ratios?! 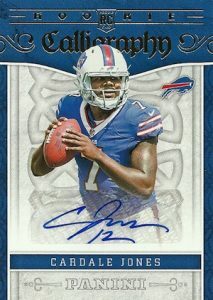 What seem to be the odds of getting an autograph vs. a jersey card in the blasters? Mike Z. 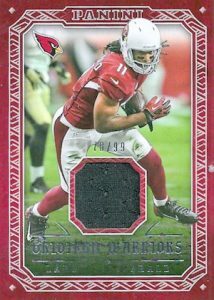 � I agree that the overall lack of odds transparency from Panini is frustrating especially since Topps and Upper Deck (usually) offer those details. I love the designs and the variety of inserts. The price is great too! Thanks Panini! I’ll give this a 4/5 only because like others Panini could’ve done a bit better of a job of three things: 1-the different kinds of armor, 2-certain numbers on the back are hard to read although it appears they did that to go along with this years theme and 3-the blaster retail stating one memorabilia or auto a box. 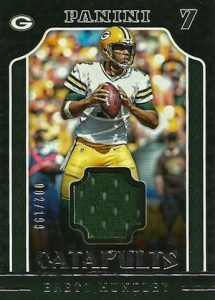 Just about every panini blaster I’ve ever busted in any sport yielded a memorabilia. Seldom is there an auto. Other than this product looks great. I have bought several boxes over the last few months and found this product to be a fun set builder. Not the autos or jerseys mainly because you tend to get the same style piece of jersey in 7 out of 10 boxes. I will say, not specifying the print runs of the inserts is frustrating. I would like to know a little more about it but can’t find any where. Also, I would have like to see a bit of a better box where multiple hits were involved, like Absolute did. Other then that, fun product. Very nice looking product. Would like to know the odds. I bought 2 boxes and one had a pharaoh cooper squire jerseys, and the other had an eli manning autograph card. Would like to know how hard the eli manning auto was to pull. 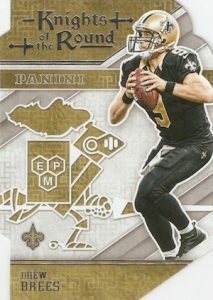 2016 PANINI DONRUSS FOOTBALL RETAIL SEALED BOX - IN STOCK!